The President of the International Criminal Court ( ICC) Sang-Hyun Song has appointed JudgeRobert Fremr to replace Judge Christine Van den Wyngaert who pulled out of case against PresidentUhuru Kenyatta. Judge Fremr will join Trial Chamber V judges Kuniko Ozaki and Chile Eboe-Osuji in hearing the case againstUhuru. Judge Wyngaert pulled out of Uhuru’s case citing heavy workload that she was handling. In a statement, President Song, said Belgian JudgeWyngaert was excused from Trial Chamber V due to the Judge’s expected workload, as she was hearing five other cases including those of Libya, Côte d’Ivoire and Democratic Republic of the Congo. On April 8, the Judge requested the President to excuse her from her functions as a judge of Trial Chamber V, which is hearing Uhuru’s case a month before the scheduled commencement of the trial. “The Judge indicated that the commencement of the trials in the Kenya cases will lead to an intensification of the work of Trial Chamber V, thereby significantly adding to the Judge’s already “unprecedented” heavy workload. The Judge submits that her assignment to that Chamber was temporary, only for the purpose of the preparation of the two Kenyan cases for trial,” saidICC President. Bomet, Kenya: Bomet Governor Isaac Rutto has accused the national Treasury of frustrating the devolution process. He said it is tampering with the budgetary allocations of county governments without the consent of governors. Pointing out a case where Bomet’s allocation was reduced to Sh3.1 billion down from Sh4.6 billion initially allocated by the Commission for Revenue Allocation (SRC), Rutto accused the treasury of making a unilateral decision that would ground the operations of county governments and render them unable to deliver on their mandate. Rutto, who is the chairman of the Governors Summit, said most county governments had already budgeted for the initial amounts adding that with the revised figure, most of the governors found themselves at cross roads. “I want to sound a strong warning to the Treasury that we are in a new dispensation where financial matters are not decided by the central government without consulting the heads of the respective county governments. We want to urge them (the Treasury) to strictly go by the allocations given to them by the Sarah Serem Commission,” he said. Rutto said he learnt of the revised allocations Monday, and he accused the Treasury of exhibiting double standards. He was speaking Monday during the swearing-in of county executive committee members in Bomet. Dr Calder Ian Maddison arrived at Lee Funeral Home at 12.17 pm and was briefed by the lead pathologist Dr Johansen Oduor. A total of 7 pathologists will be involved in the autopsy. A pathologist from the United Kingdom has arrived in the country to perform a postmortem to ascertain the cause of the death of Makueni senator Mutula Kilonzo, the funeral committee has said. Dr Ian arrived aboard KQ at 6.20am and his papers have been verified by the University of Nairobi's Prof. George Magoha. Mr Kivindyo said that the family doctor Luke Musau will accompany the team conducting the autopsy. A Chechen linesman has been given a lifetime ban for physically attacking a youth player at the end of a Russian reserve league match between Amkar Perm and Terek. As the video above shows, the linesman, Musa Kadyrov, dropped his flag and viciously went after Amkar defender Ilya Krichmar as the final whistle blew. Terek players then jumped into the mix and the scuffle then excluded the man who started it. "The ref blew the final whistle and I started walking to our bench, when suddenly someone came from behind, pushed me to the ground and began kicking and punching me," the 18-year-old Amkar player told reporters. "Terek players then joined the attack. Someone grabbed me by the throat, another hit me... bloodying my face. "Thank God, my team mates came to the rescue. Special thanks to Vlasov from Terek. We had known each other from a youth academy in St Petersburg and he helped me escape." Kadyrov said Krichmar had insulted him but the player denied the allegation. "We weren't happy with the officiating, words had been exchanged but I had never said anything personal about him or his mother," he said. "I know how sensitive Chechen people are." A former FIFA official in attendance as an assessor said of the short-tempered linesman, "He had no clue about rules, even worse, attacked a player. On a scale of one to 10, I'd give him a zero and I'm writing a special report. He should not be allowed to officiate again." So between not knowing the rules and attacking a teenager, it sounds like Kadyrov had a pretty great day. Well wishers to pay ‘Otongolo boy’s’ fees. 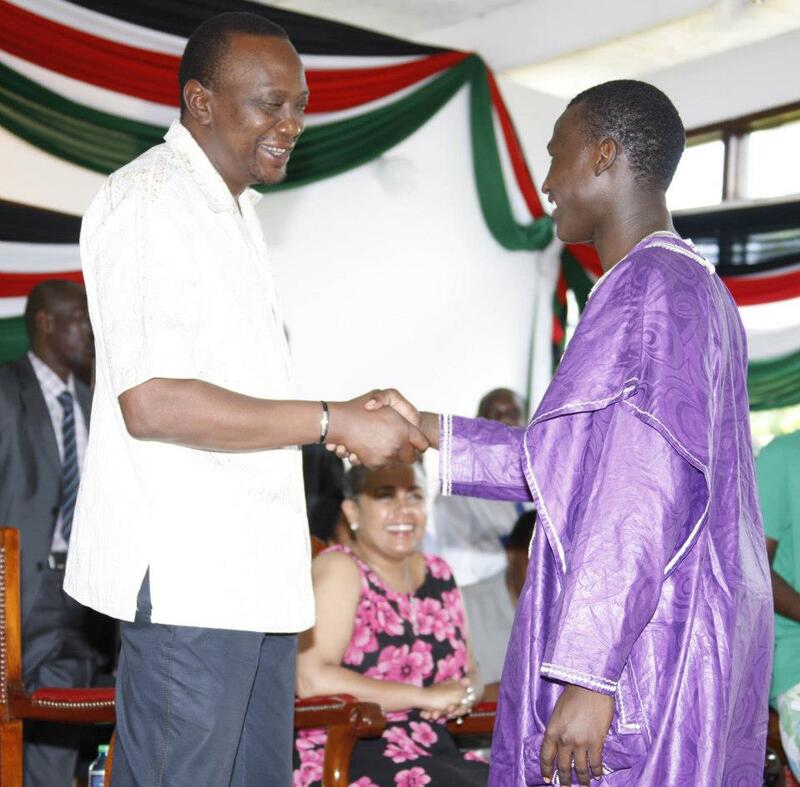 After impressing President Uhuru with his‘Otongolo Time’ narration at State House Mombasa, Daniel Awira of Highway Secondary School has continued being in the limelight. Over the weekend, Awira was hosted on NTV by Larry Madowo, where he gave the story of his journey to stardom. Apparently, his getting into drama was mostly by accident. His teacher overheard him speak with friends with the just accent he needed for the narration. Awira was at first reluctant to take the role, but when he eventually did, he went all the way to the nationals and later to State House Mombasa. NTV later ran his story and it turned out he’s from a poor background, and actually lives in a slum. Yesterday, there were concerted efforts by NTV and particularly Larry Madowo, and Safaricom to create an Mpesa PayBill number, to be used by Kenyans willing to help pay his school fees. The number is 977250. 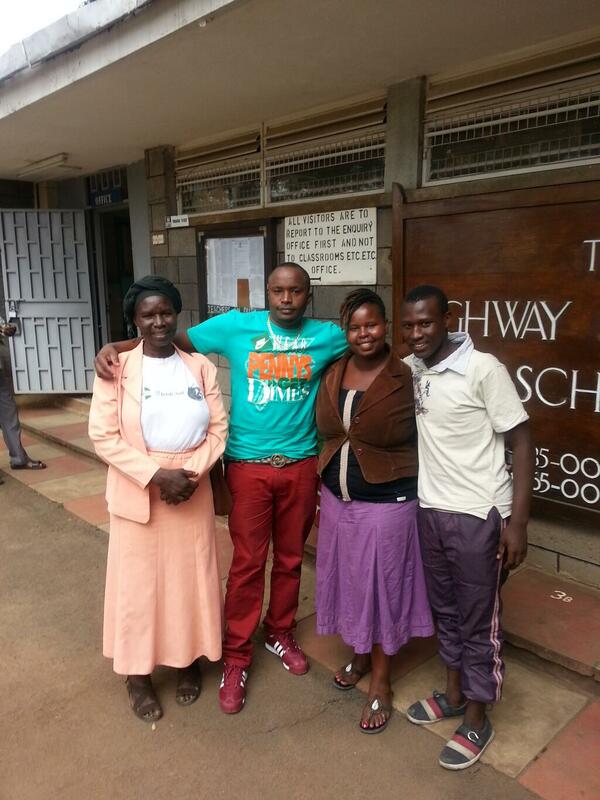 Musician Jaguar then came on board, and cleared Awira’s one year fee. Larry Madowo later revealed that the young man will now complete his high school, after collecting enough money to pay up until form. The position of the government spokesman could be up for grabs because the current occupant Muthui Kariuki's uncharismatic demeanour and perceived closeness to former Vice President Kalonzo Musyoka. Muthui’s media briefing room has been taken over by the Senate and is now the media centre. Just what killed Mutula Kilonzo? there are all manner the theories going round purporting to explain what could have happened to the always happy and positive former Justice minister. One thing that is consistent in the theories is that his death is suspect, and people are calling on the government to thoroughly investigate and establish the cause of his death. Junior traffic police officers in Nyanza region are quietly protesting the behaviour of a senior CID officer based at the provincial headquarters. The disgruntled officers called Corridors last week to complain about the deputy CID boss whom they have accused of constantly interfering in their work by authorising the release of traffic offenders. Still in the security sector, GSU officers are grumbling over the grabbing of land by a senior police officer in Drive In area along Thika road where their houses are located. The parcel of land was hived off the main residential area days before the appointment of the Inspector General of Police David Kimaiyo and construction commenced immediately. One of the buildings owned by the senior police officers has been leased by a leading supermarket chain. A prominent politician was left red-faced after his expectation to land a Cabinet position failed to materialise. The man who lost in the March 4 General Elections is now accusing one of the Jubilee Alliance principals of rejecting his appointment. FORMER Deputy Prime Minister Musalia Mudavadi could make his way back into government this week as President Uhuru Kenyatta names the remaining two Cabinet Secretaries. Mudavadi, who came third in last month's presidential election, is poised to be named the minister in charge of the Interior and National Coordination ministry, according to multiple sources in political circles. The other position is likely to go to a member of the Maasai community as the President and Deputy President William Ruto try to create regional balance in their Cabinet as required by the constitution. At the weekend, Mudavadi, who was in Western province, is said to have confided to his inner circle that he was among those who Uhuru and Ruto are considering for the position. On Saturday, Ruto hinted at Mudavadi's return to government citing his experience as Vice President and minister in previous administrations. "Mudavadi is our friend and we have resolved to walk along with him in this journe. We will not abandon him," Ruto said. He was speaking at Lumakanda grounds during the homecoming of Lugari MP Ayub Savula. Uhuru and Ruto are said to have agreed that one of the remaining two Cabinet positions should go to Western Kenya, which has received a single slot so far. Judy Wakhungu from Sirisia was nominated Cabinet Secretary for Water, Environment and Natural Resources on Thursday last week. Uhuru, Ruto and Mudavadi signed a pre-election agreement where the President would have stepped down for Mudavadi as the Jubilee presidential candidate. However, a few days later, Uhuru blamed the signing of the deal on "dark forces" within government, the short-lived marriage broke up and Mudavadi gunned for president on his own. Mudavadi is set to be the third election loser to join Uhuru's Cabinet after the President nominated former ministers Najib Balala and Charity Ngilu as Cabinet Secretaries. Balancing political interests and regional balance has been one of the issues tasking the President and the Deputy President as they put together the Cabinet. Ruto's Rift Valley backyard already dominates the nominations to the first Jubilee Cabinet with sources saying the region is now likely to lose out on the Principal Secretaries appointments. "Most of the Principal Secretaries will come from the regions that are not represented in Cabinet as the two bosses seek to form an all-inclusive government," an aide to the two told the Star. The President named four Cabinet Secretary nominees from Ruto's backyard meaning there will be five people from Rift Valley—including the Deputy President—in the Jubilee Cabinet if the nominees are approved by Parliament. The region also benefited by the naming of Lawrence Lenayapa as State House Comptroller. The President's Central backyard got three slots, as did Eastern Province. However, Uhuru could be seen to have picked four from his stronghold of the larger Mt Kenya region. Uhuru and Ruto, who won the election on the Jubilee Coalition ticket, got most of their votes from Rift Valley and the Mt Kenya regions. Not only did the expansive province of Rift Valley get most of the most slots in Cabinet but it also landed dockets that are perceived to be among the most powerful and crucial in government. Last Tuesday, as the President unveiled four of the nominees, he named the head of macroeconomics at the Treasury, Henry Rotich, as the nominee for Cabinet Secretary for National Treasury. Investment banker Phyllis Kandie was nominated Cabinet Secretary for East African Affairs, Commerce and Tourism. Management expert Felix Kosgey was named to the Ministry of Agriculture, Livestock and Fisheries while former Interim Independent Electoral Commission commissioner Davis Chirchir was named to the Energy and Petroleum ministry. The list from Central includes Samuel Macharia (Health), Ann Waiguru (Devolution and Planning) and Michael Kamau (Transport and Infrastructure). University of Nairobi deputy vice-chancellor Prof Jacob Kaimenyi, who was nominated to the Education docket, hails from Meru which is in Eastern though it is considered part of the Mt Kenya region. The other nominees from Eastern are former Water minister Charity Ngilu, who has been proposed to take up the Ministry of Lands, Housing and Urban Development and Hassan Wario who is the nominee for Sports, Culture and Arts. Coast and Western Kenya got one slot each. Former Tourism Minister Najib Balala, who hails from the Coast, was named to the Mining ministry while Western's Wakhungu was nominated to the Ministry of Water. Nyanza region got two positions with Fred Okengo being named as Cabinet Secretary for Information, Communication and Technology while Raychaelle Omamo was named as the first Kenyan woman to head the Defence docket. Former Justice PS Amina Mohammed (Foreign Affairs) and Aden Mohammed (Industrialisation and Enterprise Development) were the two nominees who hail from the North Eastern Region. Aside form regional balance, the constitution requires all appointments made in government meet the two-thirds gender rule. The appointing authorities are also supposed to ensure that the appointees are people of high integrity and professional. It has emerged that naming an 18-ministry government structure was strategic for Uhuru and Ruto should there be need to create more or split some of the existing ones. The constitution allows for 22 ministries. Kenya:President Uhuru Kenyatta is yet to send the list of the 16 Cabinet Secretaries they have nominated to Parliament for vetting. National Assembly Speaker Mr Justin Muturi said yesterday he would table the list in Parliament once he receives it. “The President has all the time to submit the list to Parliament and once that is done, I will issue communication from the chair and refer the list to the Appointment Committee to act on it,” Muturi said. Muturi said the Appointment Committee would meet and come up with its programme for vetting the nominees, which will be communicated to the public. “I want to appeal to the public to conduct themselves with decorum during the vetting process and not to be emotional when presenting their views,” Muturi said. Muturi was speaking to The Standard and KTN journalists, after leading a team of MPs to the Nairobi home of Deputy Speaker Joyce Laboso to condole with her following the demise of her mother Rebecca Laboso last Wednesday. Uhuru is expected to send the list of their nominees to Parliament for vetting before it is returned to him for appointment. Deputy President William Ruto has said the list will be released by Wednesday this week so as to enable them embark on picking Principal Secretaries, ambassadors and those to head State corporations. Sources close to the President and his Deputy told The Standard yesterday that the remaining two ministries were likely to go to professionals from the Maasai and Luhya communities. Leaders from the Maasai community led by MPs Joseph Nkaissery (ODM) and Gideon Konchella (URP), have accused the Jubilee Coalition of side-lining the community in the appointments. The struggle for “justice” will always be contested; no wonder Rajeev Dhavan in The Phases of the Indian Supreme Court has identified seven different and conflicting phases undergone by that institution. And it is not in India alone where the Supreme Court has been witnessed to reverse itself; in the United States of America, the Supreme Court there, for instance, repudiated its 1896 ruling in Plessy v Ferguson when in 1954 it rejected the idea of “separate but equal” in Brown v Board of Education. Today, however, my point on “justice” is non-legal: you should have taken judicial notice of the fact that the 1997 elections in Kenya were stolen. Moreover, you should have taken further judicial notice that the 2007 Kenyan elections were also stolen. And because of this, you should have made the observation that it cannot be expected that these results would be accepted by any right-thinking members of society. This point is neither frivolous nor flippant: it is, instead, fundamentally and importantly critical. For it is inextricably woven to a vital aspect of your identity: your place in history. By speaking of your place in history or historical place is meant your future standing as part of Kenya’s history following a critical assessment of your performance; you can actually influence, define and shape this by the way you yourselves define and execute your own purpose and mandate. And the constitution is important here because as the CJ notes, “I am convinced our constitution decrees our status quo as unsustainable and unacceptable. As you go about developing this new indigenous jurisprudence that departs and disconnects from the status quo and also incorporates and is driven by our constitutional values, it cannot be that you are unfaithful to a fair rendition or narration of Kenya’s history. After all, what then would “notions of fairness” be about? In your court during the 2013 election petitions we, however, saw go unchallenged by yourselves a one-sided, lop-sided, topsy-turvy, self-interested, belligerent, bellicose and brazen attempt to re-write Kenya’s electoral history. In short, through oral and written submissions, the Chair of the IEBC was suggesting that the problem was not that the 1997 and 2007 elections were not free and fair; rather it is that the petitioner Raila Odinga suffers the debilitation of being a chronic and serial rejecter of results that do not favour him. It could be that the IEBC Chair is suggesting that contestants should accept results whether or not they are free and fair. However, it could also be the case that he is suggesting that the 1997 and 2007 elections were free and fair. Both, I would suggest, are a ridiculous and absurd travesty to “notions of fairness”. In a recent paper, Kibwana and Mutunga have proceeded to…determine whether, given the government’s response to Kenya’s democratisation project, the general election of 1997 would be free and fair. With regard to the 2007 elections, the Independent Review Commission (IREC) headed by Justice Kriegler concluded in its executive summary, “The integrity of the process and the integrity of the results were so gravely impaired by these manifold irregularities and defects that it is irrelevant whether or not there was actual rigging at the national tally centre. Yet, in both 1997 and 2007, someone was declared the winner of these elections – which clearly is electoral theft from the other candidates who contested these elections as well as the people of Kenya who were the voters. How, then, is anyone supposed to have accepted these results under any “notion of fairness”? Mugambi Kiai is the Kenya Program Manager at the Open Society Initiative for Eastern Africa (OSIEA). The views expressed in this article are entirely his own and do not reflect the views of OSIEA. As the national drama festivals came to an end, one young man managed to shift attention from Butere Girls' play 'Shackles of Doom'. Daniel Awira, a form two student at Highway Secondary School impressed the audience at State House Mombasa, including the president and his wife, with his narrative 'Otongolo Time'. Below is the full video of his performance. Dr Mutunga, in a statement, said he has never been bribed and urged Kenyans to show respect to members of the Judiciary. In a facebook posting titled "The Judicairy demands justice from Kenyans", the Chief Justice said allegations of bribery during the petition caused him anguish, and he could have personally arrested whoever attempted to do so. "For me the most hurtful allegation was that I had been bribed in the Presidential Petition. I did not know where to turn. I have never been offered a bribe in my life. I have no doubt in my mind that anybody who dares offer me a bribe, regardless of status, would be the first one I arrest under the Constitution and the laws of this land," said Dr Mutunga. In his posting, the Chief Justice recounted instances on social media in which members of the Judiciary were targets of public vitriol. Dr Mutunga additionally urged Kenyans to treat members of the Judiciary with fairness. "Recently the Judiciary, and particularly the Supreme Court, has been the target of attacks from Kenyans. We have been the target of attacks, slander, libel, and outright indecent, vulgar, and unacceptable abuses. "All I can demand from Kenyans is justice that they demand of me and the Judiciary I head. We must give justice to each other in implementing our progressive Constitution. "I acknowledge that public service means accountability to Kenyans. However, the same Constitution Kenyans use to demand accountability of us, and they invoke it for the protection of their freedom of speech, and for their right to public participation, also demands justice for judges and magistrates. The Constitution does not decree that Kenyans are not accountable for their actions! "I urge Kenyans to give us justice! To do so is simple. If you have any evidence of our wrong doing the Constitution under its Article 168 allows you to petition the Judicial Service Commission for our removal. And if you do not have such evidence then give us justice, treat us as family, compatriots and fellow human beings!" said Dr Mutunga's posting. Dr Mutunga, by being the Chief Justice, is the President of the Supreme Court that rejected a presidential election petition by former Prime Minister Raila Odinga that challenged the election of President Uhuru Kenyatta. In the 113-page detailed judgement, the court said that it considered all the evidence presented by Mr Odinga and his co-petitioners in the matter and concluded that the evidence did not warrant nullification of Mr Kenyatta’s victory. Maina Kiai, head of a civil society organisation in Nairobi, and Joel Barkan, a US think tank expert on African governance issues, both suggested that the court should have ordered a runoff between Uhuru Kenyatta and Raila Odinga. Uhuru and Ruto wouldn’t lie to us, would they? Is Mudavadi Headed for Cabinet? How did president, deputy decide on names?